Sadly, this killer whale had been struggling for some time in the surrounding waters before she was finally found washed ashore. 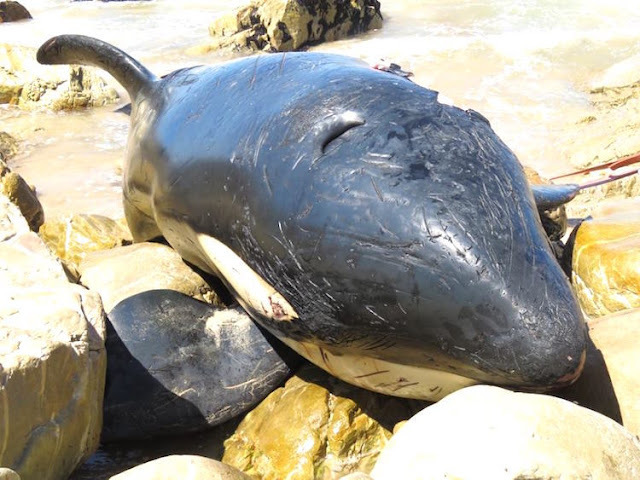 After one successful rescue attempt to return it to the water on December 22nd, the poor orca was found washed up on Lookout Rocks, Western Cape (South Africa) on December 24th, 2015. As you can see below, the surf can get pretty rough at Lookout Rocks. 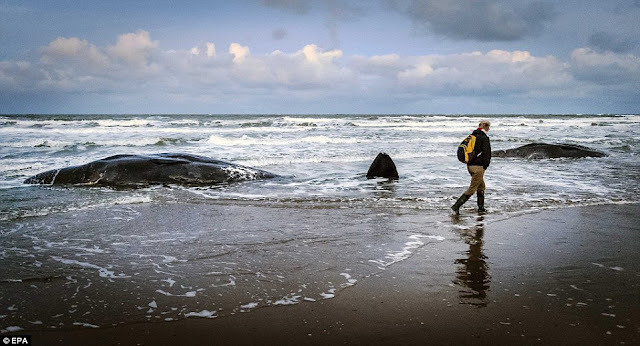 To swim around in that heavy surf in a weaken state, a killer whale needs to have a good functioning biosonar system if it expects to avoid being washed into the rocks. In fact, with all the air bubbles and sand kicked up by the heavy surf, a healthy killer whale would never have swam within 500 meters of this shoreline. Killer whales don’t go where their acoustic sense of direction does not work. They simply turn around and go where their biosonar functions just fine. That it ended up stranded on the rocks, is proof that it had been suffering from echo-navigation failure for some length of time. And, since navigation failure and the failure to use sound waves to locate its food go hand and hand, it’s not hard to understand why it had no fresh food in its stomach. Nor is it hard to understand why it stranded a few days earlier. After a necropsy was performed, items such as yogurt cups, the sole of a shoe, food wrappers, sea grass and tubed organisms were found in her stomach, according to marine mammal researcher Dr. Gwen Penry. Penry wrote that she suspects that the animal was “starving” because she didn’t have actual food in her stomach. I don't think so. My gut feeling is that this female was injured by a moderate vertical thrusting seaquake (link) 900 miles south of Madagascar as she was crossing the mid-ocean ridge. She was likely on her way to Crozet Islands (link), 1400 miles south of Madagascar. There is a distinct pod of killers whales that hangs out just offshore at the river mouth, ready to prey on young sea lions learning to swim. I doubt if she was the only one of her pod injured, but she was the only one to survive long enough to beach. The only other possibility that might fits the time pattern and the flow of the current is some type of offshore explosion. Maybe someone has a photo bank that can identify her? 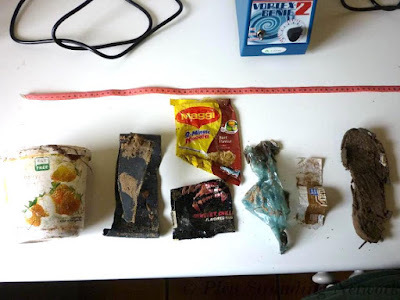 Those that know absolutely nothing nothing about the fantastic biosonar system of odontoceti say the blame goes to the plastic trash and other marine debris. In October, EcoWatch wrote about a mature sperm whale found dead in Taiwan that had vast quantities of plastic bags and fishing nets filling its stomach. A recent paper published by Environmental Research Letters, A Global Inventory of Small Floating Plastic Debris, suggested there are 15 to 51 trillion microplastic particles in the world’s oceans, weighing somewhere between 93 and 236,000 metric tons. “This is roughly seven times more than what we thought before,” noted EcoWatch. THE PLASTIC GARBAGE IS BAD NEWS BUT IS NOT THE PROBLEM FOR HEALTHY WHALES. THEY ONLY EAT GARBAGE WHEN THEIR BIOSONAR SYSTEM HAS BEEN DISABLED BY A BAROTRAUMATIC SINUS INJURY.